The big question we’ve been trying to answer is, "Is motorcycling getting safer or more dangerous?" In Part 1 we dabbled in the history of motorcycle fatalities in the USA, noting that there was a surge in motorcycling in the 1970s that resulted in a huge spike in fatalities. The immediate government uproar caused the motorcycle industry to pour money into rider training, and started the ongoing helmet law debate. Let’s also note that your personal risks depend on factors such as your age. Riders in the 18-28 age category have a disproportionate share of nasty crashes and fatalities, but fewer heart attacks or strokes. Riders in the 40-55 age group have fewer crashes than younger riders, but greater risk of medical problems. And as you age into your 60s and 70s, you can predict that your chances of death will more likely be from medical problems than from "accidents". The National Highway Transportation Safety Administration (NHTSA) calculates that the average motorcyclist in the USA has about 30 times the chance of having a fatal crash than the average auto driver. 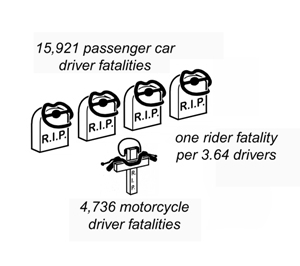 It might be instructive to compare the fatality rates for cars against the rate for bikes. We’ll use vehicle registrations for the moment. 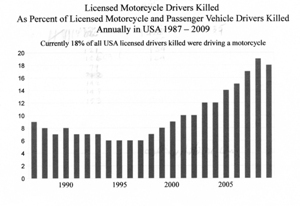 The fatality rate for automobile drivers has always been lower than that of motorcycles, and it’s been steadily dropping. In 1978 the rate was just under 28 fatalities per 100,000 registered highway vehicles. In 2009 it was less than 10. By comparison, in 1978 motorcycle fatalities topped out at 94.02 fatalities per 100,000 registered motorcycles. The lowest motorcycle fatality rate so far is 53.79 (2010). 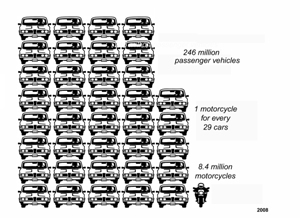 So, comparing motorcycles to passenger vehicles, based solely on registrations, the current odds are roughly 54 to 10, making the risks of riding a bike around 6 times greater than driving a car. Unlike motorcycles, the weight of the motor vehicle you’re driving has a huge impact on who gets hurt. The heavier your vehicle the better your chances. That’s probably why the motorcyclist so often gets injured in a car/bike collision. As a reality-check, let’s just compare total USA motorcyclist fatalities to USA passenger vehicle driver fatalities, based on vehicle registrations. "Passenger vehicles" for this purpose include automobiles, pickup trucks, vans, and SUV’s. We’ll compare drivers only. USA fatalities, 2010 reg. veh. If those numbers are correct, they mean that 3% of registered vehicles (motorcycles) are racking up almost 20% of all motor vehicle drivers killed. 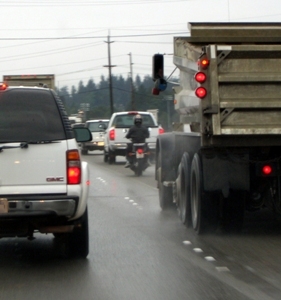 NHTSA is moving toward a fatality rate based on Vehicle Miles Traveled (VMT). Comparing fatalities to VMT is potentially more realistic, because it paints a clearer picture of a motorcyclist’s relative exposure. And I’ve been assured by my scientist mole that NHTSA is working hard to develop foolproof systems for accurately counting motorcycle VMTs. Frankly, I’ve been skeptical of VMT for motorcycles because I haven’t had much faith that anyone knows how to measure the cumulative miles motorcyclists rack up in any given year. Passenger vehicles are easier to count by means such as compression strips across highways. But can a pressure strip differentiate between a Smart Car, a Gold Wing, or a Spyder? Let’s hope they figure out a reliable way to count bike mileage. 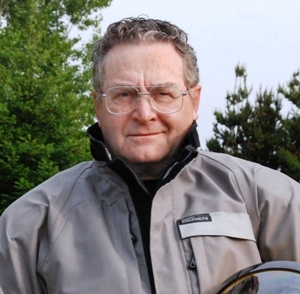 Officially, by 2014, states will have to compute VMT for motorcycles as well as cars. NHTSA releases a Traffic Safety Facts bulletin every year (with about a 2 year lag). They chart the fatality rate for motor vehicles per 100 million VMT. Back in the 1950s the rate was above five per 100 million VMT, but dropped to 2.48 by 1978, and has steadily declined since then, thanks to such advances as crash barriers, safety glass, ABS, airbags, shoulder belts, and frontal crush zones. The passenger vehicle rate was down to 0.87 fatalities per 100M VMT in 2009, while motorcycles have been consistently up in the range of 20-30. That’s probably where NHTSA gets their statistic that the average motorcyclist is 30 times as likely to die in a motorcycle crash as the average motorist. That may be a lot more depressing than the rate based on registrations, but I don’t have any reason to believe it’s not realistic. There’s another way of looking at the relative dangers of motorcycling. We can just compare the total number of motorcyclist fatalities in a given geographical area to the total population of that area. The usefulness of the rate per population is reliability. It’s very realistic because both motorcyclist fatalities and population are accurately tracked. It doesn’t make any difference how many of the citizens actually ride motorcycles. We’re measuring the relative danger to society from motorcycling. The "best" time frame for motorcycling was the years spanning 1997. We might note that the motorcyclist fatality rate is currently higher than it used to be, in all four states. That’s more than a curiosity; it’s a measure of the relative dangers of motorcycling, and also a measure of the effectiveness of the states’ motorcycle safety programs. What’s clear from the various fatality rates is that although all vehicles are less dangerous than they used to be, passenger vehicles are getting safer at a much faster rate than motorcycles. It could also be a hint that our motorcycle training/licensing programs are less than successful at getting new riders up to speed for today’s hectic traffic. If you enjoy being seen as a risk-taker, you can now quantify that, and maybe hang a sign on your bike: "I’m 30 times more dangerous than you are!" (make that 40 times if you’re under age 40). On the flip side, if you want to reduce your risks of riding, we could offer some suggestions. 1. If you’re just thinking about getting into motorcycling, or you are mentoring a new rider, be realistic about the potential dangers of motorcycling. Come to grips with the risks, your own willingness to accept the risks, and your attitude about managing the risks. If you don’t want to become a highly proficient rider, or if the dangers are just unacceptable to you, or if motorcycling just makes you nervous, hang it up. 2. Absolutely separate alcohol/drugs and riding. The average sober motorcyclist may be 30 times more likely to die in a motorcycle crash than the average passenger car occupant. 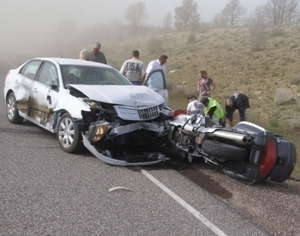 But a rider under the influence of alcohol or drugs jacks the risks up way higher. It’s not just alcohol, but medications that degrade vision, judgment, muscle control, and reaction time. If you’re over 65, recognize that prescription drugs can be a big factor in jacking up the danger. 3. Develop your situational awareness to a high level. Train yourself to scrutinize the situation as far ahead as you can see details. Learn what trouble looks like, and what to do about it, and take control of the situation. The book Proficient Motorcycling is a good source of information about repeating traffic, road, and surface hazards. 4. Practice the correct control skills to gain the "muscle memory" to control your machine accurately without having to think about it consciously. Proficiency doesn’t come easily. You need to learn the correct habits. Then it takes hundreds of repetitions to make skills automatic. Training courses are available to help you reinforce the correct skills and unlearn bad habits.